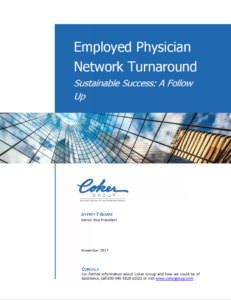 Many hospitals continue to bleed red ink via their employed physician networks (EPNs) because the “here and now” of their shrinking margins consume them. They focus on the losses that continually nibble at their profit and loss statements (P&Ls), and they fail to see and take the long view. Often, the C-suite is so engaged in the present and applying Band-Aids to the shrinking margins that they fail to consider the painful, yet lifesaving, surgery that needs to be performed. This action includes revamping the structural integrity of the EPN. As impending changes in payment methodologies are spawned, they essentially reward health systems for keeping patients out of the hospital and managing them in the ambulatory outpatient clinics. With the proper design and implementation of a strategy, gentle tending to the EPN, the hospital and provider relationship can flourish.